Despite the growing relevance and expansion of secondary education across the world, tran-sitions to secondary education in India are inequitable, divisive and strained. More so, if youth belong to groups that are subject to marginalisation and exclusion including those living in urban poor locales and particular social categories that have been historically disad-vantaged in India. 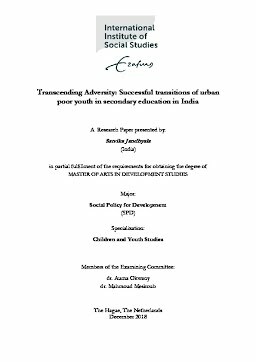 This research is an attempt to bring to the fore and privilege the narratives of urban poor youth who despite these adversities are successfully transitioning to secondary education in an urban poor locale in Hyderabad, India. By contextualising the distinct gendered complexities of youth in secondary education, the study establishes an intrinsic link between socio-cultural norms and education in India. The research findings point to the strong role of families and youth who carry the burden of negotiating socio-cultural norms to ensure youth successfully transition to secondary educa-tion. However, the lack of a clear articulation of an action-plan to tackle issues of socio-cultural norms affecting secondary education in the policy and the lack of collaborative net-works among relevant stakeholders to address these issues places the responsibility of tran-sitions to secondary education on families thereby making them tenuous in practice.